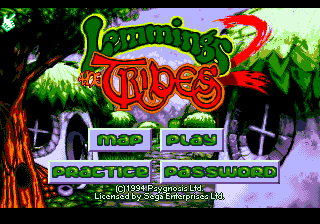 Lemmings 2: The Tribes is a sequel to Lemmings, and was released, among other consoles, for the Sega Mega Drive in 1994. Gameplay is much the same as in its prequel, however now Lemmings are split into "tribes", each with their own special skills. There are over 120 levels and 60 different skills. Sega Master System and Game Gear versions were reportedly completed (and even reviewed), but never released. In 2014, the main programmer Matt Taylor released them both in the SMS Power! community boards. Main article: Lemmings 2: The Tribes/Magazine articles.